The solar power technology has become the most surprising innovation as well as evident and practical applications in today’s era. Solar Carports is one such application of solar power system. They are an offshoot of traditional carports providing protection and shade for vehicles. Typical carports are not only different from solar carports but have different installations and hardware. Equipment used for ground-mounted solar panel systems are similar in Solar Carports. As a result, they require a similar installation process. For home-based or automobile owners, a typical carport or yard cover provides shading and is undoubtedly a value-add. Moreover, its one-dimensional simplicity is a missed opportunity. So, if you are passionate about PV, following emerging technologies in the solar industry, then the term solar canopies one of the solar industry solutions is also known as solar carports. 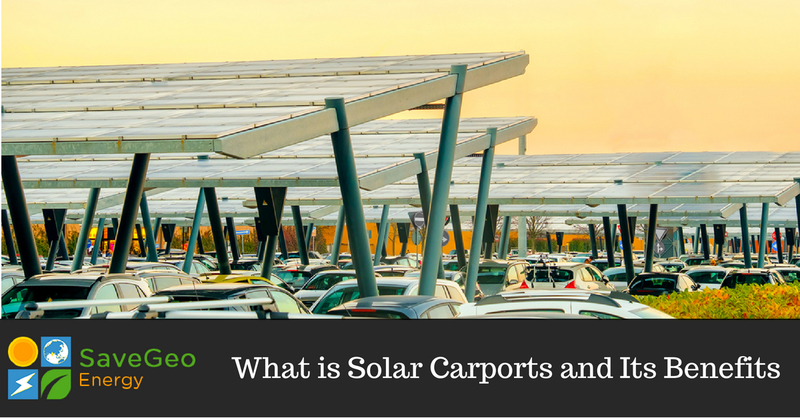 Before we dive into the benefits of solar carports, let us first understand what solar panel carports are? Solar carports are customized to include solar panels in their structure, and it does not require a surface or roof to which the solar panels must attach to, this is what makes solar carports stand out of the crowd. It is distinct from installing solar panels on an existing carport which already has a built-in roof. From producing clean energy to covering the owner’s vehicle, the panels themselves serve as a dual-purpose solution. The solar panel system has many things in common with ground mount solar panels that are angled panel modules installed on the ground instead of on a rooftop. Both the solar panel racking systems, eliminate the need for a surface on which the panels could be mounted. To make space for a car parking, the installation of solar carports are taller in compare to a typical ground-mounted solar system. Apart from this, both the solar systems are considerably related and offer the benefit of allowing installers to locate the panels at the most optimal angle for sunlight exposure. The flexibility of solar carports is the primary benefit as you can customize your solar project as per your choice. Installing solar carports on a rooftop solar system can be difficult due to the limitation of many variables. Whereas, to any specifications, a ground-mounted solar system can be built anywhere. Thus, a solar carport can give an opportunity to any property owner as the rooftop solar system might not be able to support 100 per cent of the solar panels that you want to install. With the amount of energy produced, the direction of your solar panels and angles at which they are placed has a tremendous impact. To optimize the area of your solar panels a solar carport can be structured, but this might not be as simple for a rooftop solar panel system. Another advantage of installing solar carport is that it can easily integrate with a home battery or electric vehicle (EV) charging port. Moreover, the electricity generated from this solar power system is just like any other solar energy. The solar power generated from this system can be stored in a battery, funneled into your EV battery, home usage or exchanged for credits in the grid. Overall, this solar technology gives you a significant amount of flexibility on how to use your solar power system. With the availability of land at your facility, SaveGeo customize their services and solutions based on the environment, orientation, and electrical design concerning your location. As your solar partner, we design and deliver the perfect solar power solutions to ensure the structural integrity and long-term performance of your solar project with minimum impact to the surroundings.